For whom Duktop SSIB-17 is intended? Today we’re going to review the Duxtop SSIB-17 Professional 17 piece Stainless Steel Induction Cookware set with impact-bonded technology. This line of cookware is produced by the Secura Company. They mainly manufacture induction cook-tops. With this being said, there is no doubt Duxtop cookware will work awesomely for all your cooking needs. They really did make this set with induction cooking in mind. Now, this set is built to last. Take Care of it and you can pass it down to your grandchildren. Suitable for virtually all cooking surfaces, electric, gas, infrared, induction stove, radiant glass, or ceramic. First listed on Amazon on October 31, 2013, it has remained one of the top-rated cookware sets on the website. The stainless satin finish makes this a beautiful set. Maybe so nice you won’t even want to use them. Read next: Calphalon Signature vs Contemporary – Which One To Buy? They made the Duxtop SSIB-17 with everyone in mind. 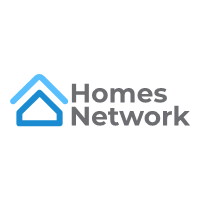 Their products are focused on how easy they are to use, made from high-quality material, with an ergonomic design. The ergonomically shaped, anti-slip handle is riveted to the pan to provide maximum durability and possess stay-cool technology. Anyone can use this set successfully. You will need to season the cookware before use to prevent sticking. After cooking simply wipe out with a paper towel. If you do need to clean them with soapy water, then you will have to season it again afterward. This set is pricey though if you’re not going to use it on an induction stove. If you have an ordinary gas or electric stove this probably isn’t the set for you. This set includes both an 8 and a 9.5-inch fry pan. 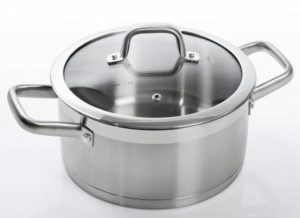 It also has both a 1.6-Quart and a 2.5-Quart saucepan, each with a lid. The 8.6-Quart stockpot with lid is great for soups and stews.A 4.2-Quart casserole pan with a lid and a 5.5-Quart sauté pan with helper and lid. And that’s not all. They also have a 9.5-inch pasta basket and steam basket. And lastly, a three-piece kitchen tool set. Though, it would be nice to have a steaming basket for the large pot. Constructed with 18/10 commercial grade stainless steel and a heavy gauge impact-bonded aluminum encapsulated bottom. Impact bonded means very durable. This is created by a friction process to form a bond between the base of the vessel and the disc. No forms of adhesive are applied in the process. The disc is placed in the bottom of the pan, and when passed through the impact bonding machine, through friction and pressure the bond is then formed. It’s compatible with all forms of cook-top use. It’s also dishwasher-safe, oven-safe up to a whopping 550 degrees F, and freezer-safe for food storage. Read next: Brita vs PUR pitches? The impact bonding assists in even cooking, without hotspots. You shouldn’t need the Limited Lifetime warranty because this set well made and very durable. On the downside, this cookware is not non-stick. Food is more likely to stick in a stainless steel pan and hand washing is suggested. If seasoned correctly though, they can be much easier to clean. You would season these similar to a cast iron skillet by heating vegetable oil in the pan and wiping it out. Preheat your oven to 350 degrees, and wash and dry the pot or pan to be seasoned. Take a couple tablespoons of oil and wipe around the inside of the pan and then bake for an hour. Cool it down and you should be good to go and your cookware should now be non-stick. If you find food sticking to the bottom, it’s time to season it again. You do need to be careful of hot moisture dripping from the lids when they are removed. The lids of the pans do not have a lip to catch moisture. These pots and pans are very heavy. You can get a work-out in while you cook. If you have trouble lifting, you may want to try something lighter. If you don’t have a problem with the weight, this makes a fine set. For some people, the Duxtop Professional 17 Piece Stainless Steel Induction cookware set is perfect with induction cook-tops. 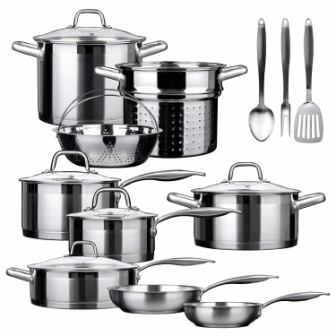 It is comparable with the Chef’s Star Stainless Steel 17 piece induction cookware set. You get the same options for a little less money. Or if you don’t need the cooking utensils and you like non-stick cookware. Check out the Fleischer & Wolf Aluminum Black Induction 10 piece cookware set. Or perhaps look at the Michelangelo Ceramic Induction 12 Piece cookware set with nonstick ceramic copper pots. There are many choices these days when it comes to induction cookware. All types of colors and materials to choose from. Once again if you don’t have an induction cook-top, you can find regular cookware for considerably less money. And if you decide to go with induction cookware anyway, make sure it’s suitable for the cook-top that you have. If you have an induction cook-top the Duxtop Professional 17 Piece Stainless Steel Induction cookware is perfect for you. It has numerous benefits when it comes to cooking evenly and preparing great meals. Your Duxtop cookware works great with other types of stoves as well. If your bringing a dish to the big family dinner, you don’t have to worry if someone else’s cook-top is gas or electric, your dish will re-heat just fine. So for homeowners or professionals who want durable multi-use cookware set, the Duxtop brand is what you need for your home or business. 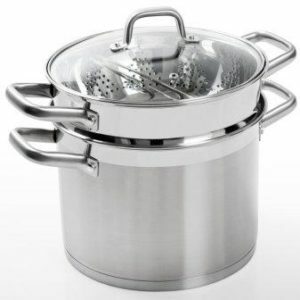 The pots and pans are sturdy and reliable and can handle extremely hot or very cold temperatures. 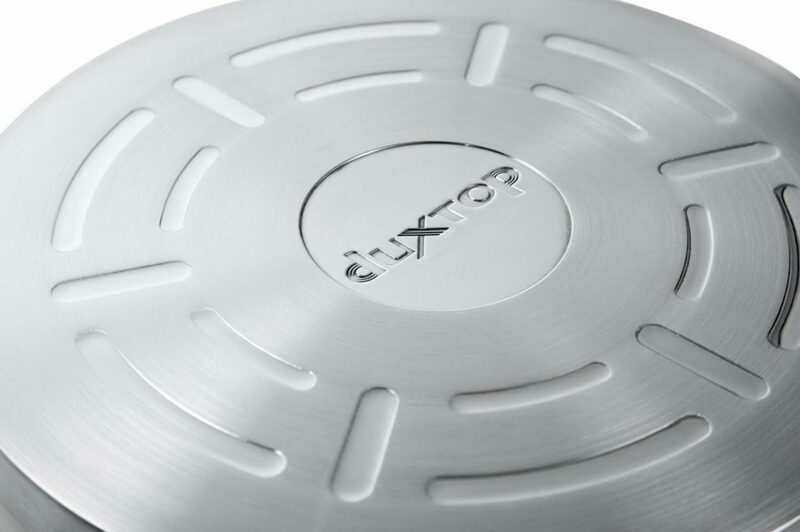 The Duxtop cookware is one of the many choices to choose from, but the best decision can only be made by you. I hope I have given you enough information to make an educated decision on the proper cookware designed specifically for the use you intend. You will not be disappointed in the Duxtop brand. The company has been around for over ten years, and they know a thing or two about induction cooking. It’s a great set that will last for many years if cared for properly. So if you enjoy induction cooking as much as I do, go out and get the last cookware set you will ever need. It looks great, and it cooks great and will last a lifetime. I hope you are as happy as I am with the Duxtop Professional 17 Piece Induction cookware set. And I hope you have many great cooking experiences with this set in the future. Thank you for reading.